BKT Elektronik company produced a series of industrial rack cabinets according to IP54 air-tightness standard. The cabinets were designed in a response to market’s demand for creating cabinets compatible with 19-inch devices and suitable for the environments requiring extra safety measures. The cabinets are fitted with ventilators and their structure enables the application of the AGC Extinguishing Apparatus for fire suppressing. Fig. 1. Air conditioned industrial IT rack cabinet IP54 with an installed ventilator. 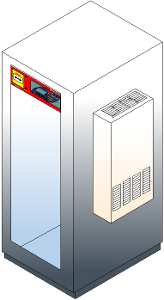 server rooms where the application of the large-scale fire suppressing system embracing the entire surface of the room is impossible; server rack cabinets – constructed pursuant to an increased air-tightness standard (IP55) – fitted with an attached ventilator providing optimal cooling of the devices inside the cabinet and with AGC Master Extinguishing Apparatus (in the set of cabinets joined sideways AGC Slave Extinguishing Apparatus is also used) is the simplest, the cheapest and the most effective solution for securing the electronics against fire and poor environmental conditions. 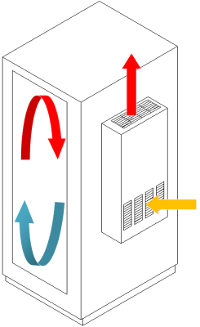 manufacturing spaces, store houses (increased humidity, dust etc. ); the construction of the cabinet provides the maximal security level for contained devices against conditions inside i.e. a production hall. 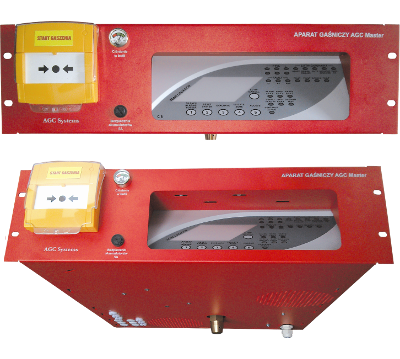 The applied solutions enable easy configuration of devices inside the cabinet. Additionally, the application of AGC Master Extinguishing Apparatus (in the set of cabinets joined sideways AGC Slave Extinguishing Apparatus is also used) secures the cabinets against the fire. 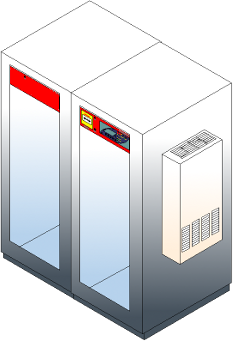 frame bearer of the industrial IT rack cabinet is based on a certified aluminum section with an extended flange which improves the air-tightness of the casings. The standard version of the cabinet is fitted with two pairs of sections inserted in a way to enable an unrestrained positioning and configuration of space inside the casing. It also possible to provide casing for the cabinet loaded up to 1000kg. Additional feature of the cabinet is the possibility to insert backer plates of various size in the rear space. The cables are inserted to the cabinet through cable holes on the roof and floor or upper and lower part of the rear covering. Cable holes (in standard version secured by an air-tight cable glade) can be fitted with brush cable glades, foam sealed pass-through cable glades, varied in diameter standard PG outlet cable glades or the sealing of other producers can be used. EGO is an innovative series of air conditioners which applies modern technologies and a distinguished design compatible with TEXA Rack Cabinets. Data on rack cabinets presented due to the courtesy of BKT Elektronik company.